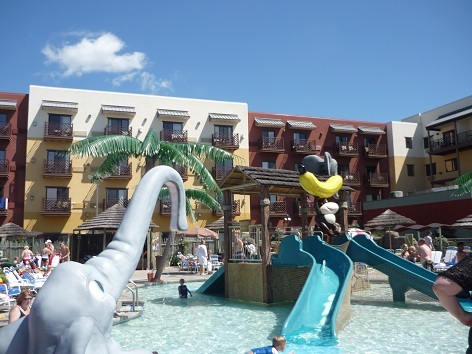 What sets Kalahari Resort in the Wisconsin Dells apart from the other Dells waterparks? 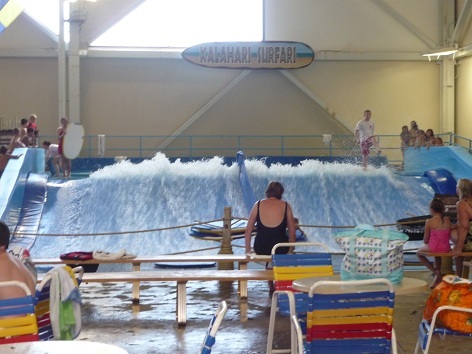 While the Kalahari Wisconsin Dells water park offers both indoor and outdoor wet and wild fun, it also allows folks who are not guests of the hotel to purchase a day pass to play. Most of the other area water parks are stay and play parks, or in other words for guests only. The Kalahari features 125,000 sq ft of indoor chills, spills and thrills. 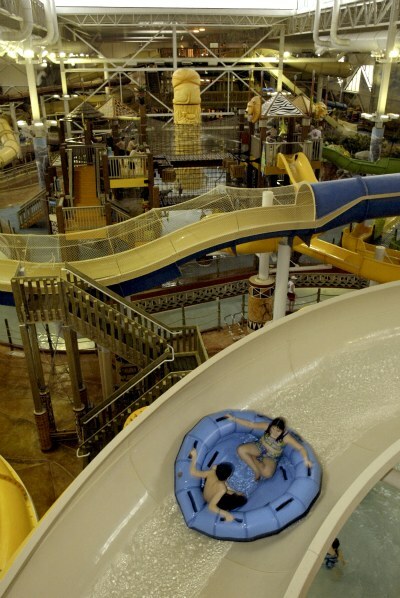 It is also the largest indoor water park in Wisconsin, which is known as the water park capitol of the world. 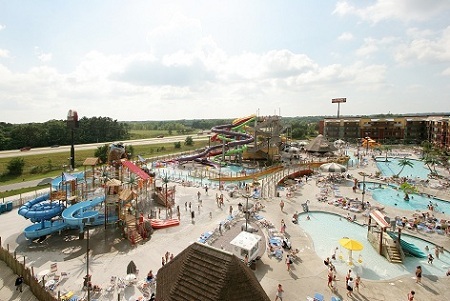 The Kalahari water park Wisconsin Dells was beat out for the title of world’s largest indoor water park by its sister hotel in Ohio which was finished in 2007 and is 178,000 sq ft. When you first walk in, you’ll immediately notice the expanse of the African theme for the resort. The African Kalahari region’s name is derived from the Tswana word Kalagare, meaning "a waterless place." 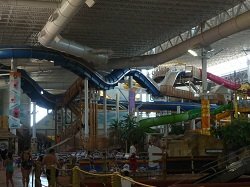 Ironically, Kalahari Resort-Wisconsin Dells’ water parks hold 1,282,234 gallons of water making it one of the largest in the nation. Staring off with the Kalahari Resort, it’s truly an experience to enjoy with your family or friends. The benefit that the Indoor Water Park has over the Outdoor Water Park is being able to use the park in any season. It’s a luxury and is a nice break if you want hide from the sun or stay inside from the cold Wisconsin winters. My experience in the Indoor Water Park started with the infamous “Flow Rider.” Here is a little insight of what you can expect when entering the Indoor Water Park. What a great idea to have a real life wave machine for people to experience. Flow rider is a massive wave pool where you can ride a boogie board or surf board for that beach experience. The atmosphere that surrounds Flow Rider is great because of all the spectators that are watching your every move. Flow Rider gives you a real life body surfing experience without being at the beach. Surfing didn’t start until later so I was a little disappointed because I was restricted to just body surfing. But let me be the first one to say that body surfing on Flow Rider is still a great time. 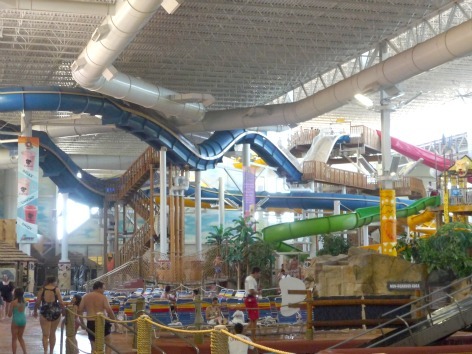 This is a must ride for kids because there is nothing else like it at the Kalahari. Master Blaster was my favorite waterslide in the Kalahari Resort indoor water park. If you’re a big fan of roller coasters, this is the ride for you. The Master Blaster offers a roller coaster feel that takes your through blinding corners and dips. This seemed to be popular among the tourist because the line was longer then the Flow Rider. I enjoyed this ride so much that I went right back up the stairs to ride it again! Victoria Falls is a family ride for 2 to 3 people. If you are driving north on I-90, you notice a yellow slide coming out of the indoor water park. Well this is the infamous slide that takes you from inside to outside in a hurry. Surely a fun ride for the family to share together that takes you through many turns. The ride isn’t the fastest, but it’s made for the family to relax and enjoy. If you want to get wet and go through twists and turns, then this is ride for you. You start off and end with blinding turns that are unexpected throughout the ride. The name really suites what the ride is all about. A great ride for all ages to enjoy. The Rippling Rhino is a family raft ride that requires 2 to 3 people. The line wasn’t long, but then again it was a beautiful day outside to use the outdoor park. Easily the longest ride with simple and joyful turns. The little kids seemed to really enjoy this ride because the length from start to finish. The Tanzanian Twister is a mirror copy of the outdoor ride Swahili Swirl. The one big difference is that you don’t need a tube or a mat for this one. This fast and exciting ride will take you through a couple of turns where you’re dropped into a bowl shaped spiral. You are then tossed around the bowl and eventually dropped straight down into the end. This was a fun ride for me because I prefer the body slides rather than having to use a tube. One of the shortest water slides that I have been on. Don’t let the length fool you as the Zig Zag Zebra gives you a quick thrill. 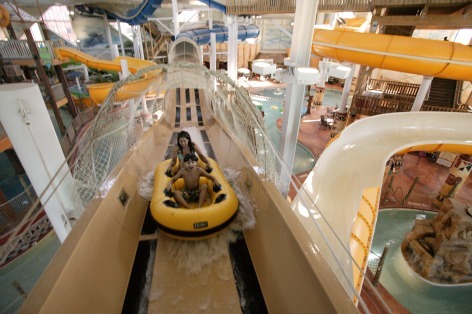 Another water slide at the Kalahari Resort that takes you through unexpected turns! If you’re expecting huge 10ft waves, then this isn’t the type of wave pool for you. The waves are very small, targeted for little kids to enjoy. There were a lot of parents with their little kids in the wave pool waiting for the next wave to crash on in. It’s a great place for the little ones to enjoy an ocean like wave. This lazy river offers the same exact relaxing feel to it as the outdoor water park. If you want some down time or are just looking to have fun with the family, then try out the lazy river. 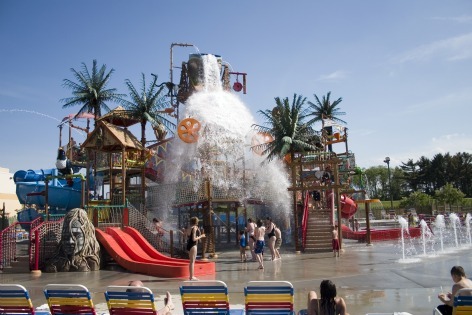 Leopard’s Lair is the play zone for all the little ones looking for decent sized water rides and a whole lot of fun. With water guns, nets to crawl on, and splashing water, kids are bound to find something that will keep them busy. Leopard’s Lair resembles the outdoor water park attraction Safari Splash Down, with the addition of more water slides. This is a must for all the children seeking to have that Kalahari Fun! This low key, kids play area is for the smaller kids looking for a little fun. It offers one long water slide with four mini slides that keep the toddlers busy. If you don’t want a crowded area for your kids to play in, then this is the place to be. But that is not all that’s inside the massive African themed Kalahari Resort. 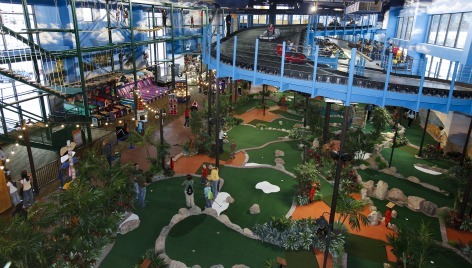 There is also a full sized game arcade, indoor go-karts track, ferris wheel, laser tag, bowling lanes, indoor golf, and when you are exhausted from a hard day of play, there are even private cabanas with full service and flat screen televisions you can relax in. 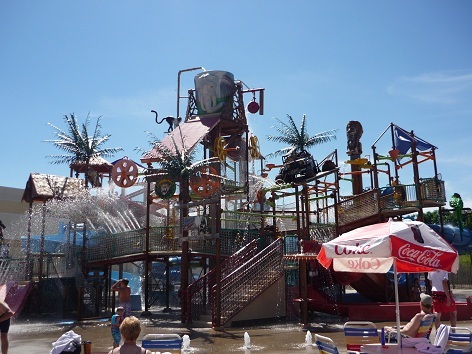 Between the exciting rides, laser tag games, and all the other games and arcades, it isn’t any wonder the resort is considered one of the best of the best water theme amusement parks. But that is not all, during the warm months of the year, your overnight stay also includes access to the 75,000 sq. ft. outdoor water park. The Kalahari Resort outdoor park is every bit as exciting and enjoyable as the indoor theme park, with plenty of thrills and adventures for the whole family. 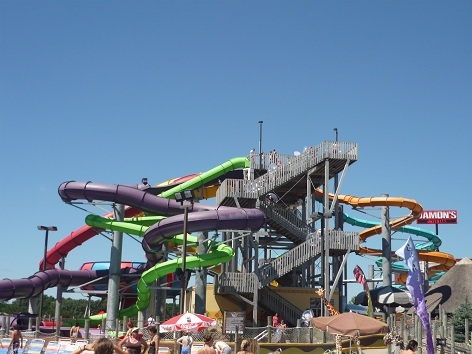 Here is a rundown of the slides and attractions that Kalahari’s outdoor water park has to offer. Easily the longest wait of the six water slides, so I was excited to see what the Swahili Swirl had in store. The ride consisted of a short turn that dropped you straight into a huge looking bowl aka the “Swahili Swirl”. The bowl then proceeded to swirl you in a circle about four times where it dropped you into a tunnel. After you hit the tunnel, the ride shoots you down a drop that takes you into the crashing waters below. The ride wasn’t the quickest, so if you’re looking for a break from action, here’s your shot. From what I was hearing the “Anaconda” is a family favorite as you get to fit your whole family on one tube. I felt out of place because most of the people waiting in line had the big family tubes whereas I had the single tube. The four person ride, or in my case, the one person ride started off going backwards. The ride shoots you through downhill turns and loops, where you are met at the end with a waterfall. If you’re looking to get wet, this is a great ride to go on because the end will get you soaked. Probably the shortest of all the water rides, but it was quick with many unexpected turns. Going up to the top of where the water slides begin, the Zimbabwe Zipper stands out because it is the only non tube water slide. Without any prior knowledge, I would have thought it would have been the worst of the outdoor rides because there was visibly no line on such a nice day. With little expectations, it was time to see what the Zimbabwe Zipper had to offer. I don’t know if people were scared of the ride or what because the “big green machine” takes the crown for the quickest water slide at the Kalahari Resort. With sharp and blinding turns going at a pace of around 40 mph, the Zimbabwe Zipper is sure to please any waterslide fan. This was my favorite ride of the whole entire indoor/outdoor water park because of the uncertainty that takes place. Extreme Rush consist of two mirror image slides (right next to each other) that must be ridden on a mat. Whether you want to race your friends or just enjoy a fast long thrill, this ride has it all. You start off on your belly with the mat underneath you, but make sure you hold onto the handles because this ride will whip you. Extreme Rush will take you into many quick turns without any notice. The kids seem to like this ride a lot because the line was filled with energetic kids, waiting to race. If you’re looking for turns and loops in complete darkness, the Wild Wildebeest will not disappoint you. The name says it all because the ride is “wild” with unexpected thrills and waterfalls waiting to get you wet. 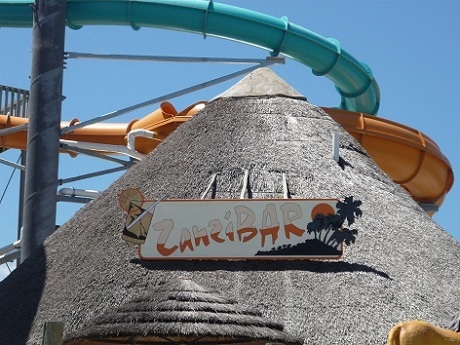 This tube only ride will take you through an adventure unlike any other outside ride at the Kalahari. I was shocked by the line because of the lack of interest the ride was getting. Once you experience the Wild Wildebeest, you will see why this was one of my favorite rides at the Kalahari Resort. If you want some downtime in the sun enjoy the lazy river, grab a tube and float along the water park with the family. This is a perfect chance to take a break from the waterslides and relax. A one-of-a-kind interactive play fort for the kids. Splashdown Safari in the Kalahari Resort is every kid’s dream when it comes to playing with water. It has everything from slides, obstacles and even a large bucket of water that pours down on the kids to cool them down from the heat. The Zanzi bar has many different types of alcoholic beverages for adults twenty one and over. I enjoyed a Mai Tai, a personal favorite of mine by poolside. There are seats up by the bar and along the railings that overlook the water park. Looking for a quick place to grab lunch for the whole family? Capetown Concessions offers a variety of food for the whole family to enjoy. I enjoyed a cheeseburger meal that included fries, carrots, and a soft drink. The prices were very reasonable for the quality of food that is served. 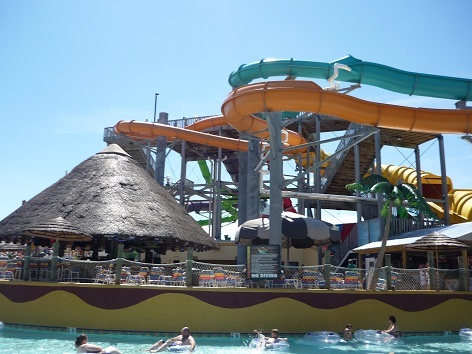 One of the best theme park water parks in the area, the Kalahari Resort offers plenty of fun and excitement for the entire family to enjoy and is truly a one stop vacation destination for one and all. What will amaze your family is the overall size of the park, and activities the Kalahari Resort has to offer. With over 700 rooms, suites and condos there is plenty of space for families of all sizes to stay. Add that to 312,000 sq. ft of attractions, and there is no question why over 10 million people have stayed at the Kalahari in the past 10 years. The room options within the resort are huge. Each room has an authentic African Theme that can sleep from 2 - 8 persons. Plus you have the option of a condo that would include a full kitchen and separate bedroom areas. 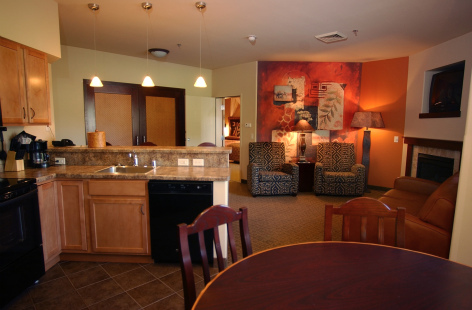 Every room has amenities that include, refrigerator, microwave, coffee maker, internet access, television, and in room safe for your valuables. There are many eating, dining, and adult beverage options located within the Kalahari Resort. We ate at Kahunaville one night and found that the food was very good and not to overpriced. It was a very nice pub type atmosphere that we enjoy. We also had breakfast at the Great Karoo one morning and call for in room pizza one evening. They also have tiki hut type food and beverage option right inside the waterpark. Damon’s Grill is right next door and a several other restaurants within a mile of the resort. From adrenalin pumping, heart pounding theme park excitement to the relaxation of a full spa treatment, sun lounges and cabanas to soak up the rays, the amenities just never seem to end. With 7 onsite dining options, unique retail shops, and the 27-hole award winning Trappers Turn golf course, the Kalahari Resort has it all. 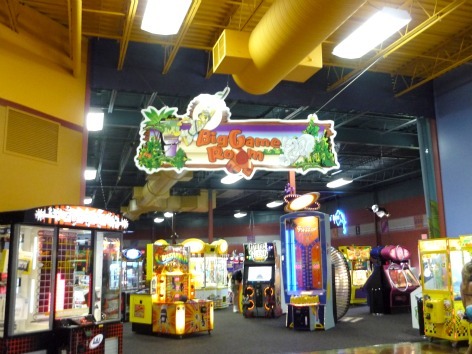 The "Big Game" Room Arcade with interactive games & prize redemption for exciting prizes! Activity center for kids and families with lots of crafts, games & movies. When you arrive pick up a complete listing of events! Guests at Kalahari Resort are offered complimentary access to two complete fitness areas. Featured are weight training equipment, treadmills, ellipticals, bikes and more. The spa at the Kalahari Resort has several professional treatment salons and offers manicures, pedicures, tanning, full-body treatments, facials, various massage therapies, including deep-tissue, and hydro-therapy. Just up the road is the resort owned Trappers Turn Golf Club. 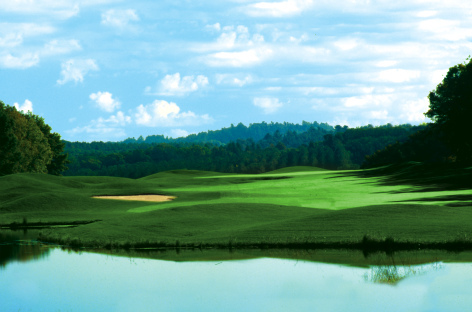 This is an established 27-hole, award-winning golf course of championship design that golfers of all levels can enjoy.